For the second year in a row, EHNAC Executive Director Lee Barrett has been named by Health Data Management as one of our nation’s Top 50 Health IT Leaders for 2017. Healthcare IT is fortunate to have many knowledgeable experts willing to share what they know with others. 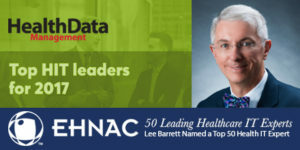 Following up on last year’s popular look at 50 of the leading HIT experts in the field, Health Data Management today and tomorrow offers this compilation of some of the guiding lights of the industry, many of which are new to the list this year. Some have worked to advance the industry for nearly half a century, while others are newer voices who have taken on the industry’s new challenges. All are worthy of mention as a sample of those who are advancing the important work of healthcare IT. For the full slideshow, visit Health Data Management.